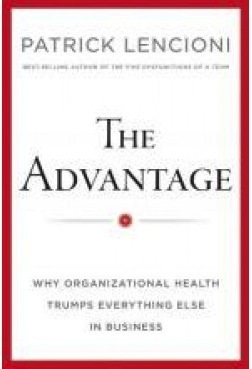 The Advantage: Why Organizational Health Trumps Everything Else In Business by Patrick Lencioni. San Francisco: Josey Bass, 2012. xvii, 216 pp. Patrick Lencioni is founder and president of The Table Group, a management consulting practice focused on organizational health and executive development. He is the author of nine other books. His others are written as business fables with a point, and this is his first departure from that format. “The single greatest advantage any company can achieve is organizational health. Yet it is ignored by most leaders even though it is simple, free, and available to anyone who wants it.” p. 1. “I asked the CEO a semi-rhetorical question: ‘Why in the world don’t your competitors do this?” After a few seconds, he whispered, almost sadly, “You know, I honestly believe they think it’s beneath them.” p.2. After making the case for organizational health, Lencioni develops this “simple and free” strategy. He starts with building a strong leadership team and then defines mission clarity (but not the bureaucratic and often cumbersome mission statement). How do you get everyone on the same page, pulling in the same direction, focusing on what is most important for the business. Two key factors in this include managing conflict and clear, repeated, common messages. The next to final chapter addresses the importance of creating purposeful meetings. He gives a charge in the last chapter. He includes many helpful examples from companies where his group has done consulting. Lencioni is a good writer and has great insights on people, particularly in a business setting. This book is no exception, though it is less “fun to read” than his fables. But like so many others who have strong views, he is often guilty of overstatement. It starts with the words in the title: “organizational health trumps everything else.” There are many other crucial factors in business: product, managing costs, marketing, and price are examples. A company would also fail if these things were not right. This overstatement is not just in the title, but is fundamentally a part of the argument. He oversimplifies in another way in his chapter on “Creating Clarity.” The argument that everybody in the company should be working toward a single strategic objective crucially depends on how that objective is stated. It may be that a problem in logistics (example on pp. 124-125) needs to be solved for the company to succeed. But that doesn’t require the marketing department to focus on logistics. You can’t let other important things drop. His big point is that it shouldn’t be possible for divisions to succeed when the company is failing, and this is certainly true. But working this out requires much more nuance than he provides. There are lots of good ideas in this book, and I would recommend it to business leaders, and other organizational leaders as well. Even those in “following” positions would benefit from this book in seeing why a company focus is so important. But I found the frequent generalization and oversimplification to be distracting rather than clarifying and would encourage reading this with caution.